Home / Automotive / News / Bugatti Niniette 66 ' A Sport Yacht! Even if you don’t like Bugatti’s, you will have to love this limited edition Bugatti yacht. If you do love Bugatti’s though, then why not buy a yacht to match your Bugatti Chiron Supercar. 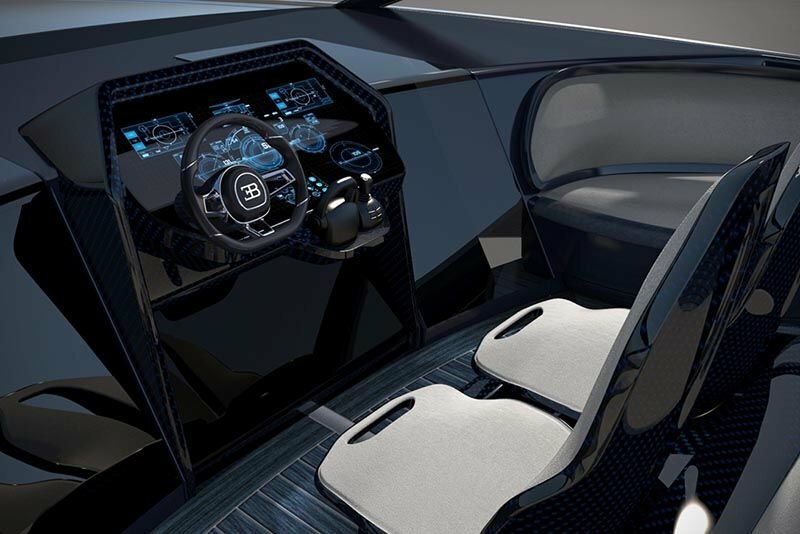 The Bugatti Niniette 66 limited edition sports yacht is something from your wilder dreams. Of course, the yacht is going for a whopping 2.2 million dollars, which isn’t bad for a 66-foot long luxury yacht compared to the 2.6 million dollar Bugatti Chiron – which only has 2 seats. The luxury yacht is made of carbon fibre composite to make sure it can go fast. You know... why else? Bugatti has said it can reach up to 44 knots and, if you are already sold, get your order in now as there will only be – as its name suggests – 66 up for sale. Deliveries of this limited edition yacht will begin March 2018. If you are still not satisfied then wait until you see what's inside. The spacious open deck comes with leather seats and naturally blue Morta oak wood features. The lower deck houses a champagne bar, sun pad, plenty of open seats and a private jacuzzi. Oh, and a fire pit. The interior below deck has massive couches with a big screen TV and adjacent to that sits a king sized bed. If that's not enough room, there's also another massive couch next to the bed if you have extra people staying over. It's definitely double-dipped in opulence and excess but hey, if not why not. Take a look through the drool-worthy images of the Bugatti Niniette 66 in the gallery above! Video: Laferrari, Bugatti Veyron, Ferrari Enzo, Lamborghini Diablo And Other Supercars At The Prescott Hill Climb. Video: Brand New Bugatti Chiron Getting Unloaded In Monaco! The 1479hp Bugatti Chiron Is Here! Video: 0-371km/h In A Bugatti Veyron Vitesse L'or Rouge!